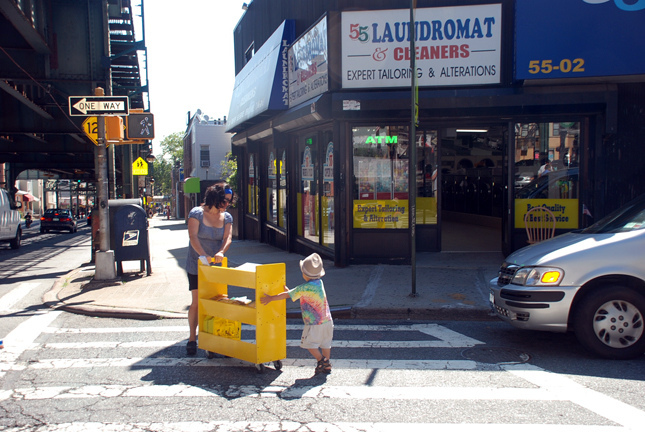 In response to public library budget cuts, Micki’s project A Woodside Walk: Bubbles and Books engaged her neighbors in a series of literacy-based activities that took place in and around her local laundromat. Micki’s activities included creating a hand illustrated local guidebook for parents to use during neighborhood walks with their children, building a book cart for her laundromat and organizing story times for her neighborhood’s families. Micki Watanabe Spiller is an artist, whose work examines the narratives of space, through sculpture as well as artist books. She has been in many group and solo shows both nationally and internationally. She has participated in residencies at Smack Mellon, the Evergreen House in Baltimore, The Bemis Center for Contemporary Arts, and World Views Studios in the World Trade Center. She is a recipient of the Pollock-Krasner Grant, Art Matters Grant and a Regional NEA grant. She received her BFA from the Kansas City Art Institute, and her MFA from Ohio State University. Currently she is a faculty member at Parsons School of Design and Pratt Institute. Most recently, she juggles her time going to museums with her 3-1/2 year old son, teaching and trying to get to the studio.